The great Buddha of Kamakura was cast in about 1252 out of 93 tons of bronze, a remarkable technological achievement at the time. The temple it was originally housed in was destroyed by a tsunami in 1498 and it has sat in the open ever since. I’m told that a real tourist circus takes place there every day but I don’t care. 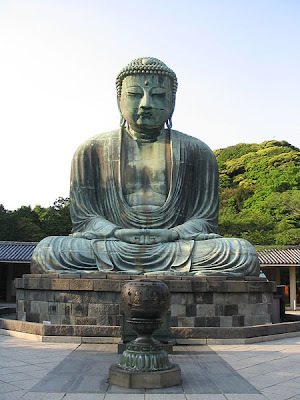 This picture I found of the Kamakura Buddha really transmits a feel of peace and immovable peace and stillness. I visited this place some years ago. This statue does not have the characteristic serene smiling face of Buddha statues. It looks sad, I thought. Perhaps the reason for the sad expression is this: Behind the statue at its bottom is a door to enter the statue. Inside the statue there is a staircase (I guess this as I did not enter) for people to climb to the top where there is a window at the back of the statue's head for people to look out and enjoy the view. As the statue is huge, the visitors' head sticking in and out of the back of the head look like crawling maggots when seen from far. Another disgusting sight is the tossing of coins around the base of the statue. With all this abuse how can the Buddha statue look happy? I visited the Buddha about a decade ago. It was a fresh cool sunny morning after a night of blizzard. The temple was quiet and serene. And I found the Buddha a source of peace and stillness indeed. Rather than sadness, I thought the expression conveyed a sense of equanimity, undisturbed by the mundane world. Buddha images in Japan always look somewhat stern to me. There was a time when I had a very troubled mind. There was this Buddha image on top of the Tai Pei centre which looked so compassionate and peaceful such that I always looked at it whenever I passed by, and felt much comforted. I visited this Buddha and found it an incredibly moving experience. Yes, there were huge groups of schoolkids around the base taking photos - but why shouldn't they? It is, after all, one of the finest sights in Japan. And Amida Buddha literally rises above and looks kindly down upon all that goes on below. Yes, you can enter the statue, but the starcase is closed off. And the tossing of coins? That's good people making offerings - a beautiful sight. I was looking for a Buddha image and I stumbled upon your site, and was touched by your description of yourself. I am not an enlightened one, but I am working on a project that you might like to see. I have been doing a papercut image of the Buddha every day for a year, and just finished image number 260. I am posting the images on a Facebook page called "A Buddha A Day." I would be delighted if you or some of your followers wanted to look at it.